Still, we’re not done with CIA. Its relationship to Jim Jones and the Peoples Temple, and therefore to the Jonestown massacre, is an important issue that will be discussed in subsequent pages. Here, however, we are concerned with the initial reports of the massacre. And, in particular with those responsible for labeling the disaster a “mass suicide”—contrary to the evidence being gathered by Dr. Mootoo. The person who seems to have been most responsible for spinning the story in that way was Dr. Hardat Sukhdeo, a psychiatrist. Dr. Sukhdeo is, or perhaps was, “an anti-cult activist” whose professional interests (according to an autobiographical note) were “homicide, suicide, and the behavior of animals in electro-magnetic fields.” His arrival in Georgetown on November 27, 1978 came only three weeks after he had been named as a defendant in a controversial “deprogramming” case. [Sukhdeo was named with "deprogrammer" Galen Kelly in a suit brought by the Circle of Friends on behalf of Joan E. Stedrak. The suit is believed to have been filed on November 6, 1978] It is not entirely surprising, then, that within hours of his arrival in the capital, Dr. Sukhdeo began giving interviews to the press, including the New York Times, “explaining” what had happened. Jim Jones, he said, “was a genius of mind control, a master. He knew exactly what he was doing. I have never seen anything like this…but the jungle, the isolation, gave him absolute control.” Just what Dr. Sukhdeo had been able to see in his few minutes in Georgetown is unclear. But his importance in shaping the story is undoubted: he was one of the few civilian professionals at the scene, and his task was, quite simply, to help the press make sense of what had happened and to console those who had survived. Accordingly, he was widely quoted, and what he had to say was immediately echoed by colleagues back in the States. In an interview with Time, Sukhdeo refers to an “autopsy” that had been performed on Jim Jones in Guyana. This can only have been a reference to Dr. Mootoo’s somewhat cursory examination, in which Jones’s body was slit open on the ground. It is difficult to understand how Sukhdeo could have been aware of that procedure without also knowing of Mootoo’s finding that most of the victims had been murdered. Dr. Sukhdeo was himself a native of Guyana, though a resident of the United States. He claimed at the time that he’d come to Georgetown at his own expense to counsel and study those who had survived. But that is in dispute. That said, there is more at stake here than public perceptions. Investigators of the Guyana tragedy have a responsibility to both the living and the dead: to find out what actually happened, and to make certain that it cannot happen again. 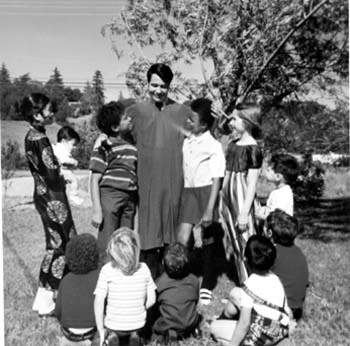 Image from a Peoples Temple brochure, portraying leader Jim Jones as the father of the “Rainbow Family”. 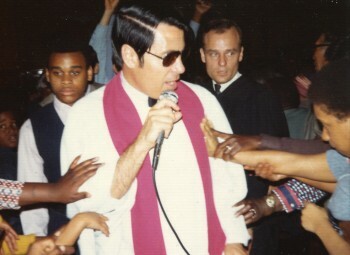 Image courtesy of The Jonestown Institute, http://jonestown.sdsu.edu. The Peoples Temple was created in the political deep-freeze of the 1950s. From its inception, it was a leftwing ally of black activist groups that were, in many cases, under FBI surveillance. [For many years, the FBI maintained a "Racial Intelligence" file. A 1968 Airtel sent to that file refers to the Bureau's concerns the possible emergence of an American "Mau Mau," the "rise of a (black) messiah," and "the beginning of a true black revolution."] During the 1960s, when the Bureau and the CIA mounted Operations COINTELPRO and CHAOS to infiltrate and disrupt black militant organizations and the Left, the Temple went out of its way to forge alliances with leaders of those same organizations: e.g., with the Black Panthers’ Huey Newton and with the Communist Party’s Angela Davis. And yet, despite these associations, and its ultra-left orientation, we are told that the Temple was not a target of investigation by either intelligence agency. In the early 1970s, suspicions began to surface in the press, implicating the Peoples Temple in an array of allegations including gunrunning, drug-smuggling, kidnapping, murder, brainwashing, extortion and torture. Under attack at home, and feeling the pressure abroad, Temple officials undertook secret negotiations with the Soviet Embassy in Georgetown, laying the groundwork for the en masse defection of more than a thousand poor Americans. According to the CIA, it took no interest in these discussions. Under the circumstances, only the most naive could fail to be skeptical of the disinterested stance that the FBI and the CIA claim to have taken. But what does it mean? Why would the FBI and the CIA give the Peoples Temple a pass? The answers to those questions are embedded in the contradictions of Jones’s own past and, in particular, in that most mysterious period in the preacher-man’s life: the 1960-64 interregnum that his biographers gloss over. As I intend to show, the enigmas of Jones’s beginnings do much to explain the intelligence community’s hands-off stance toward the Temple, but also the bloodshed in which ended. Jim Jones was born in Crete, Ind. in 1931. When he was three, he moved with his family to the town of Lynn. His father was a partially disabled World War I vet. Embittered by the Depression and unable to find work, he is alleged (without much evidence) to have been a member of the Ku Klux Klan. Jones’s mother, on the other hand, was well-liked, a hard-working woman who is universally credited with keeping the family together. Whatever the nature of his relationship to the lady evangelist, Jones soon found himself in the pulpit, dressed in a white sheet, thumping the Bible. The protege was a prodigy and, by all accounts, he loved the attention. In 1947, 15-years-old and still a resident of Lynn, Jones began preaching in a “sidewalk ministry” on the wrong side of the tracks in Richmond, Ind.—sixteen miles from his home. Why he traveled to Richmond to deliver his message, and why he picked a working-class black neighborhood in which to do it, is uncertain. That Jones knew Mitrione is strange coincidence, but not entirely surprising. A Navy veteran who’d joined the Richmond Police Department in 1945, Mitrione worked his way up through the ranks as a patrolman, a juvenile officer and, finally, chief of police. It is unlikely that he would have overlooked the strange white-boy from Lynn preaching on the sidewalk to blacks in front of a working-class bar on the industrial side of town. Which is to say that either Jones was wrong about the Richmond cop, or else he knew something about Dan Mitrione that other people did not. If Mitrione were to play no further part in Jones’s story, there would be little reason to speculate any further about their relationship. But, as we’ll see, Jones and Mitrione cross each other’s paths repeatedly, and in the most unlikely places. Neither family friends nor playmates (Mitrione was eleven years older than Jones), their relationship must have been based upon something. But what? Two possibilities suggest themselves: either Mitrione was counseling in Jones in the way policemen sometimes counsel children, or their relationship may have been professional. That is to say, Mitrione may have recruited Jones as an informant within the black community. This second possibility is one to which we’ll have reason to return. Very little research seems to have been carried out by anyone with respect to Jones’s early career. It is almost as if his biographers are uninterested in him until he begins to go off the deep end. This is unfortunate—particularly in light of the possibility that Jones may have been a police or FBI informant, gathering “racial intelligence” for the Bureau’s files. What is known about his early career is, therefore, known only in outline. He graduated from Richmond High School in about January, 1949, and began attending the University of Indiana at Bloomington. [Jones moved from Lynn to Richmond in the Fall of 1948.] He was married to his high school sweetheart, Marceline Baldwin, in June of the same year. It’s a peculiar story, and Jones’s biographers don’t seem to know what to make of it. What sort of meeting could it have been? The assumption is made, in light of Jones’s later politics, that it was a leftist soiree of some kind. After all, they were talking about communism. But that makes very little sense. Indianapolis was a very conservative city in 1951. (It still is.) Joe McCarthy was on the horizon, and the Korean War was beginning to take its toll. If “communism” was being discussed in anything other than whispers, or anywhere else than a back-room, the debate was almost certainly one-sided and thumbs-down. It was at about this same time that Jones gave up the study of law and, to everyone’s surprise, decided to become a minister. By 1952, he was a student pastor at the Somerset Methodist Church in Indianapolis and, in 1953, made his “evangelical debut” at a ministerial seminar in Detroit, Michigan. By 1956, Jones had established the “Wings of Deliverance” Church as a successor to Community Unity. Almost immediately, the Church was christened the Peoples Temple. The inspiration for its new name stemmed from the fact that the church was housed in what was formerly a Jewish synagogue—a “temple” that Jones had purchased, with little or no money down, for $50,000. Ironically, the man who gave the Peoples Temple its start was the Rabbi Maurice Davis. It was he who sold the synagogue to Jones on such remarkably generous terms. A prominent anti-cult activist and sometime “deprogrammer,” Rabbi Davis is an associate of Dr. Sukhdeo’s. By the late 1950s, the Peoples Temple was a success, with a congregation of more than 2000 people. Still, Jones had even larger ambitions and, to accommodate them, became the improbable protege of an extremely improbable man. This was Father Divine, the Philadelphia-based “black messiah” whose Peace Mission movement attracted tens of thousands of black adherents and the close attention of the FBI, while earning its founder an annual income in seven figures. For whatever reasons, beginning in about 1956, Jones made repeated pilgrimages to the black evangelist’s headquarters, where he literally “sat at the feet” (and at the table) of the great man, professing his devotion. With the exception of Father Divine’s wife, Jones may well have been the man’s only white adherent. That Jones made a study of Father Divine, emulated him and hoped to succeed him, is clear. The possibility should not be ruled out, however, that Jones was also engaged in collecting “racial intelligence” for a third party. In January, 1959, Fidel Castro overthrew the Batista dictatorship, and seized power in Cuba. Land reforms followed within a few months of the coup, alienating foreign investors and the rich. By Summer, therefore, Cuba was in the midst of a low-intensity counter-revolution, with sabotage operations mounted from within and outside the country. Within a year of Castro’s ascension, by January of 1960, mercenary pilots and anti-Castroites were flying bombing missions against the regime. Meanwhile, in Washington, Vice-President Richard Nixon was lobbying on behalf of the military invasion that the CIA was plotting. It was against this background, in February of 1960, that Jim Jones suddenly decided to visit Havana. Nevertheless, according to the Times story, the 29-year-old Jones traveled to Cuba to expedite plans to establish a communal organization with settlements in the U.S. and abroad. The immediate goal, Foster said, was to recruit Cuban blacks to live in Indiana. Foster told the Times that he and Jones met by chance at the Havana Hilton. That is to say, Jones gave the Cuban a big hello, and took him by the arm. He then solicited Foster’s help in locating forty families that would be willing to move to the Indianapolis area (at Jones’s expense). Tim Reiterman, who repeats the Times‘ story, adds that the two men discussed the plan in Jones’s hotel-room, from 7 in the morning until 8 o’clock at night, for a week. More recently, Foster has elaborated by saying that Jones offered to pay him $50,000 per year to help him establish an archipelago of offshore agricultural communes in Central and South America. Foster said that Jones was an extremely well-traveled man, who knew Latin America well. He had already been to Guyana, and wanted to start a collective there. The anomalies in this story are many, and one hardly knows what to make of them. Foster’s information that Jones was well-traveled in Latin America, and had already been to Guyana, comes as a shock. None of his biographers mentions Jones having taken trips out of the United States prior to this time. Could Foster be mistaken? Or have Jones’s biographers overlooked an important part of his life? Today, when Foster is asked which language was spoken, he says that he and Jones made do with the latter’s broken Spanish. The issue is an important one because Foster is, in effect, Jones’s alibi for whatever it was that Jones was actually doing in Cuba. That the two men did not have a language in common makes the alibi suspect: how could they converse for 13 hours at a time, day in and day out, for a week—if neither man understood what the other was saying? It would be interesting to know just what Reiterman is talking about here. The presumption must be that there is a photograph in which Jones is seen with a man who might easily be confused with Castro—if it weren’t for the latter’s diminutive size. In fact, however, it probably was Castro. When Jones arrived in Brazil in 1962, he carried a photograph of himself and his wife Marceline, posing with the Cuban premier. Jones said that the picture was taken on a stopover in Cuba on the way to Sao Paulo. [The reference to a Cuban stopover on the way to Brazil, and to a photo of Jones, Marceline and Castro, is told in The Broken God, by Bonnie Thielmann with Dean Merill, David C. Cook Publishing Co. (Elgin, Ill.), 1979, p. 27.] That is to say, in late 1961 or early 1962. How Jones met Fidel Castro—and why—is an interesting question. So, too, we can only wonder at his proclivity for taking photographs of mercenary pilots in their crashed planes. Pictures of that sort could only have been of interest to Castro’s enemies and the CIA. Emigration was an extremely sensitive issue in the first years of the Castro regime. The CIA and the State Department, in their determination to embarrass Castro, did everything possible to encourage would-be immigrants to leave the island. As a part of this policy, U.S. Government agencies and conservative Christian religious organizations collaborated to facilitate departures. [Religion In Cuba Today, edited by Alice L. Hageman and Philip E. Wheaton, Association Press, New York, p. 32.] Jones’s visit may well have been a part of this program. But there is no way to be certain of that. Cuba was in the midst of a parapolitical melt-down. While the CIA was conspiring to launch an invasion, irate Mafiosans and American businessmen had joined together to finance the bombing-runs of mercenary pilots. Meanwhile, the Soviets had sent their Deputy Premier, Anastas I. Mikoyan, to Havana for the opening of the Soviet Exhibition of Science, Technology and Culture. [Mikoyan was in Havana from February 4-13.] The visit coincided with the Soviets’ decision to give Cuba a long-term low-interest loan, while promising to buy a million tons of Cuban sugar per annum. The “Hilton Hotel” at which Jones was staying was the temporary home of a Sputnik satellite that the Soviets had put on display. According to former CIA officer Melvin Beck, the CIA was trying to photograph it, and the lobby was crawling with spies from as many five different services (FBI, CIA, KGB, GRU and DGI). [In this connection, an interesting coincidence concerns the presence of New York Times reporter James Reston at the Hilton. He was there to cover the Mikoyan visit, as well as the Soviet exhibition, and it seems fair to say that, in a literal sense, at least, he must have crossed paths with Jim Jones. "Reston felt a nervous laugh rising from his belly and controlled it." While one cannot say that Jones’s 1960 visit to Cuba was necessarily a spying mission, the circumstantial evidence suggests that it was. That is to say, virtually every element of the trip can be shown to have been of particular interest to the CIA: encouraging Cuban emigration; documenting the destruction of aircraft piloted by mercenaries; the Sputnik at the Hilton; and, it would seem, Castro himself. Which presents us with an enigma. According to State Department records, this was Jones’s first passport. How, then, did he travel to Cuba in February if he did not receive a passport until the end of June? Did he enter the country “black”? Was he using someone else’s documents? And what about Carlos Foster’s certainty that Jones had previously traveled throughout Latin America? Was Foster mistaken, or had Jones in fact visited Guyana? It is almost as if we are dealing with two Jim Joneses. And perhaps we are. It’s a subject to which we will need to return. Here, however, I want to point out certain coincidences of timing in the lives of Jim Jones and Dan Mitrione, and to discuss Jones’s own file at the CIA. Passports typically require about 4-6 weeks to be mailed out. Since Jones’s passport was issued on June 28, 1960 his application would have been filed in early May. As it happens, it was during that same month that Dan Mitrione was in Washington D.C., being interviewed for a new job with a component of the State Department’s Agency for International Development (AID), the International Cooperation Administration (ICA). An acknowledged cover for CIA officers and contract-spooks such as Watergate’s E. Howard Hunt and the JFK assassination’s George de Mohrenschildt, the ICA would become infamous during the 1960s, funding the construction of tiger-cages in Vietnam, and training foreign police forces in the theory and practice of torture. A few years earlier, in 1957, Mitrione had spent three months at the FBI’s National Academy. [Mitrione was then Chief of Police in Richmond. ] The connections he’d made stood him in good stead. Immediately after his interview with the ICA, he was hired by the State Department as a “public safety adviser.” Three months later, in September, 1960 he was in Rio de Janeiro, studying Portuguese; by December, he was living with his family in Belo Horizonte, Brazil. Whether or not Mitrione was an undercover CIA officer, it is a fact that the CIA’s Office of Security opened a file on Jones, and conducted a name-check on him, coincident with Mitrione’s departure for Rio. Why it did so is a mystery: the Agency won’t say. It is speculated, of course, that the file and name-check were sparked by the Soviet Bloc destinations for which Jones had applied for a visa. But that could hardly have been the case. The visa requests had been made in May, and the passport issued in June. It was not until November, some five months later, that the Office of Security sent agents to the State Department’s Passport Office, there to examine Jones’s records—an activity that would hardly have been necessary if the passport application had stimulated the name-check in the first place. Given the CIA’s reluctance to clear up the matter, one can only speculate that the Agency may have been “vetting” Jones for employment as an agent. Two points should be made here. The first is that the CIA claimed, in the aftermath of the Jonestown massacre, that its file on “the Rev. Jimmie Jones” was virtually empty. According to the Agency, it had never collected data—not a single piece of paper—on Jones or the Peoples Temple. It simply had a file on him. Which remained open for 10 years. According to CIA record, the file was only closed—and closed without explanation—in the wake of Dan Mitrione’s assassination by Tupamaro guerrillas in Uruguay. Which is to say that the lifespan of Jones’s file at the CIA coincided precisely with the dates of Dan Mitrione’s tenure at the State Department. What I am suggesting, then, is that Richmond Police Chief Dan Mitrione was recruited into the CIA, under State Department cover, in May, 1960; that a CIA file was opened on Jones because Mitrione intended to use him as an agent; and that Jones’s file was closed and purged, ten years later, as a direct and logical result of Mitrione’s assassination in 1970. To understand the significance of next occurred, one has to go back more than one hundred years. It was then, in the Northwest District of Guyana, that a prophet named Smith issued a call to the country’s disenfranchised Amerindians, summoning them to a redoubt in the Pakaraima Mountains—the land of El Dorado. One-hundred-and-thirty-three years later, in the Fall of 1978, at a great camp meeting in the same Northwest District of Guyana, upwards of a thousand expatriate Americans, most of them black, and about as poor and disenfranchised as the Amerindians who’d preceded them, died under circumstances so similar as to be eerie. They, too, had been promised that they would be freed from the calamities of life, and that they would possess lands of boundless fertility. Like Smith, their charismatic leader had a generic sort of name and he, too, had lied. The coincidence here is so dramatic that is impossible not to wonder if Jim Jones knew of Smith’s precedent. Because, if he did know, and if his politics were, as seems very likely, a fraud, then the Jonestown massacre is revealed to have been a ghastly practical joke—the ultimate psychopathic prank. According to Kathleen Adams, the anthropologist who first related the story about Smith and the Amerindians, Jim Jones was in fact familiar with the suicides of 1845. He had learned of them, she said, while working as a missionary in the Northwest District. The first is that Jones’s Cuban friend, Carlos Foster, is correct when he says that Jones was well-traveled and had been to Guyana prior to 1960. The difficulty with this, of course, is that Jones’s biographers are ignorant of any such travels. But if Jones did not go to Guyaya prior to 1960, he must have learned about Smith’s precedent while doing missionary work in Guyana—after his 1960 visit to Cuba. But when could that have been? The answer would appear to be at about the end of October, 1961. Arriving at that conclusion is by no means an easy matter, however, given the chronological confusion that his most responsible biographer, Tim Reiterman, relates. [Op cit., Raven, pp. 75-78.] Because this confusion raises a number of interesting questions about Jones’s activities, whereabouts and true loyalties, the matter is worth straightening out. It was then, according to Reiterman, that Jones confided in his ministerial assistant, Ross Case, that he’d had a vision of nuclear holocaust. According to Reiterman’s chronology, therefore, Jones left Indianapolis for Hawaii near the end of October, 1961. He then sent for his family, which joined him in what we may suppose was November. The family remained in Hawaii for a “couple of months”: i.e., until January or February. “In January, 1962, Esquire magazine published an article listing the nine safest places in the world to escape thermonuclear blasts and fallout…. That Jones made page 7 of the local newspaper is a matter of fact. Unfortunately for Reiterman’s chronology, however, he did so on October 25 (1961). Which is to say that the head of the Peoples Temple is alleged to have been in two places at that same time: in Hawaii and Guyana during the last week in October—with intervening stops in California and Mexico City. Obviously, Reiterman is mistaken, but the issue is not merely one of a confused chronology. There is evidence (including, as we’ll see, a photograph) which strongly suggests that two people may have been using Jones’s identity during the 1961-63 period. Because of this, rumors that Jones was hospitalized in a “lunatic asylum” during that time should not be dismissed out of hand. The rumors were started by a black minister in Indiana who is said to have been jealous of Jones’s success among blacks at the Peoples Temple. While the allegation has yet to be documented, there are many other references to Jones’s having been under psychiatric care at one time or another. Ross Case says that Jones sometimes referred to “my psychiatrist.” Others have suggested that the real reason Jones went to Hawaii was to receive psychiatric care without publicity. In later years, Temple member Loretta Cordell reported shock at seeing Jones described as “a sociopath.” The description was contained in a psychiatrist’s report that Cordell said was in the files of Jones’s San Francisco physician (probably Dr. Carleton Goodlett). In a recent interview with this author, Dr. Sukhdeo confirmed that Jones had been treated at the Langley-Porter Neuropsychiatric Institute in San Francisco during the 1960s and 70s. According to Sukhdeo, he has repeatedly asked to see Jones’s medical file from the Institute, but to no avail. “The nation’s leading center for brain research,” Langley-Porter is noted for its hospitality to anti-cult activists such as Dr. Margaret Singer and, also, for experiments that it conducts on behalf of the Defense Department’s Advanced Research Projects Agency (ARPA). While much of that research is classified, the Institute has experimented with electromagnetic effects and behavioral modification techniques involving a wide variety of stimuli—including hypnosis-from-a-distance. Returning to the Guiana Graphic article about Jones’s visit to Guyana, it is worth pointing out that the story throws a crimp in much more than Reiterman’s chronology. It makes a hash as well of Jones’s motive for going to South America. The Esquire article, published in January, 1962 could hardly have prompted Jones to go anywhere in October, 1961. So, too, the story in the Graphic provides clear evidence of Jones’s immersion in political intrigue. At the time of his visit, the former British colony was wracked by covert operations being mounted by the CIA and MI-6. Over the next four years, MI-6 and the CIA established a de facto police state in Guyana. Racial tensions were exacerbated between the East Indian and black populations—with the result that the PPP was soon split. While Jagan, himself an East Indian, remained in charge of the party, another of its members—a black named Forbes Burnham—began (with the help of Western intelligence services) to challenge his leadership. Despite the schism, the PPP was victorious in 1957 and, again, in 1961—just prior to Jones’s visit. Coming on the heels of Castro’s embrace of the Soviets, Jagan’s re-election chilled the Kennedy Administration. Accordingly, the CIA intensified its operations against Jagan and the PPP, doing everything in its power to increase its support for Burnham, provoke strikes and exacerbate racial and economic tensions. It accomplished all these goals, secretly underwriting Burnham’s political campaigns, while using the American Institute for Free Labor Development (AIFLD) as a cover for operations against local trade unions. Eventually, these operations would succeed: Jagan would be ousted, and Burnham brought to power. A decade later, that same Burnham regime would facilitate the creation of Jonestown, leasing the land to the Peoples Temple and approving its members’ immigration. It was in this somewhat dangerous context that Jim Jones arrived in the Guyanese capital. Putting on a series of tent-shows, replete with faith-healings and talking in tongues, he warned the local populace against thieving American missionaries and evangelists—who, he said, were largely responsible for the spread of Communism. Exactly. And how convenient for the CIA, whose activities were being hindered by reform-minded missionaries.